1. Go to your map, select the options menu and click the EXPORT DATA button. 2. Now you have the option to choose the file format. You can choose between CSV, geoJSON, KML, Shapefile and XML. Select the file type and press EXPORT DATA. Do you want to know what file type you need for your GIS/BI software? Check out our file formats guide. When exporting data that you have geocoded. In the data, an extra column will be created that will give more information about the geocoding quality. This extra column is named geocode_quality. 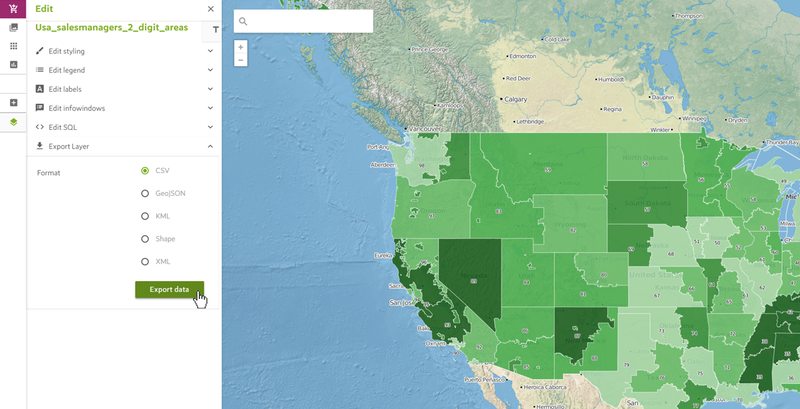 This will tell you whether your geocoded data is GOOD, MEDIUM or BAD. Every GIS software needs another GIS format. Take a look at the table below to find the GIS format you need for your GIS software. QGIS: Shapefile, geoJSON, we also offer an app to connect your QGIS software directly to the Spotzi Mapbuilder. Mapinfo: Shapefile, TAB file also possible, please contact us. Google Maps: KML, we also offer the possibility to use Spotzi Maps in embedded Google Maps. Microsoft Power BI: Please read our documentation about importing Spotzi Maps into Power BI. Got other data software where you want to import Spotzi maps? Contact us.